More nonfiction from Pat Ballard, author of 10 Steps to Loving Your Body (No Matter What Size You Are) and romantic fiction featuring big beautiful heroines. 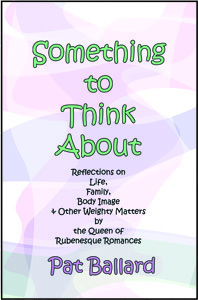 Many of the essays in Something to Think About originally appeared in Pat's free monthly newsletter, The Queen's Proclamation. Click on the links below to download PDFs with the first chapters of several of Pat's other books.